Iron is a mineral that helps build red blood cells. Most importantly, iron helps your blood cells carry the oxygen, which is needed for energy, throughout the body. Getting the right amount of iron can improve your performance in sports and in school. People who follow a vegetarian or vegan diet need to pay extra attention to make sure they get enough iron. Iron deficiency in young men is pretty rare and typically indicates something other than just a dietary insufficiency. Iron deficiency can cause a condition called anemia. Iron deficiency anemia occurs when you don’t have enough healthy red blood cells because your body does not have enough iron. Without the right amount of healthy red blood cells, your body’s muscles and organs won’t get the oxygen they need. This can cause people with iron deficiency anemia to look pale and feel weak and tired. Not getting enough iron in your diet is the most common cause of anemia. Your health care provider may recommend a multivitamin with iron if it seems like you are not getting enough iron from foods. If you are already anemic, your health care provider will probably suggest an iron supplement. Iron is measured in milligrams. The amount you need depends on your age, gender, body size, and lifestyle. In general, you can use these guidelines to figure out how much iron you need. What foods are rich in iron? 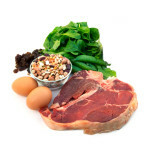 Red meat, eggs, poultry, fish, legumes (or beans), fortified cereals, and leafy greens like spinach are good sources of iron. It is important to know that your body absorbs iron from animal sources (known as “heme” iron) more easily than it absorbs iron from plant sources (known as “non-heme” iron). The best sources of iron in food come from things that might not sound too appetizing, such as beef liver and chicken giblets. However, there are plenty of foods that you probably already eat that have iron as well. The following table lists some foods that are good sources of iron. All iron content was calculated using the USDA Nutrient Database. It’s important to note that these are all estimates and can range depending on how a food is prepared and what else you are eating at that meal. Foods high in vitamin C help your body absorb non-heme iron, found in foods like fortified cereal, beans, and nuts. Eat iron-rich foods along with foods that are high in vitamin C, such as citrus fruits and juices, cantaloupe, strawberries, tomatoes, and dark green vegetables to increase the amount of iron you absorb. For example, you could top your cereal with strawberries, add tomato slices or salsa to a bean burrito bowl, or have an orange with a peanut butter sandwich. Eat a heme source of iron like meat with a non-heme source of iron to help your body absorb non-heme iron. You can enjoy a meal that contains a source of vitamin C, a source of heme iron and a source of non-heme iron such as turkey and bean chili with tomatoes, or chicken fajitas with beans and green peppers. Avoid caffeine (for example soda, black tea or coffee) when taking an iron supplement. Caffeine, as well as tannins found naturally in both coffee and some teas, can interfere with iron absorption. Choose breads, cereals, and pastas that say “enriched” or “iron-fortified” on the label. These foods have extra iron added which can help you meet your body’s iron needs.